Whether consumers will pay by credit or debit card, check and cash are no longer the only payment consideration for merchants—particularly as payment technology has evolved to include EMV credit cards, contactless payment, and mobile wallets. Though accepting the latest payment method that consumers prefer is an important aspect of delivering a positive customer experience, new payment technologies require effort and financial investment to implement. Here’s a look at the new payment options expected to shift consumer behaviors, and a bit of guidance on how to determine if the potential benefits and drawbacks justify the cost. A fast and easy way to pay. Nielsen’s Digital Consumer Report estimates that 65 percent of all Americans now own a smartphone, which is a significant adoption rate compared to the 45 percent of the population who made the same claim in 2011. Beyond ownership, users are increasingly reliant on mobile devices; the same survey indicates that Americans now spend more than 30 hours a month on mobile devices—outranking the amount of time they spend on a desktop PC. Given that smartphones have become a standard accessory, it’s no surprise that contactless payments, which allow a consumer to essentially pay for anything in store with the wave of their phone, are expected to become increasingly popular. 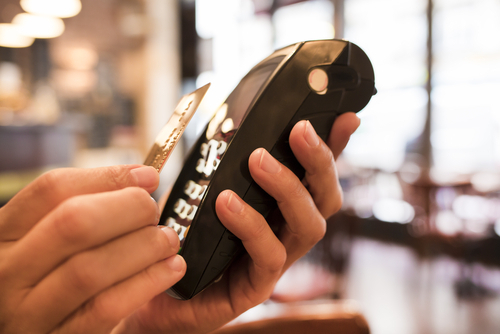 Though the new technology can introduce operational efficiencies, including the ability to process more customer transactions per hour and less staff required to man traditional payment terminals, implementing contactless payment technology may require a significant investment before cost savings are realized. For example, accepting contactless payments requires upgrading existing terminals to support the technology, even though all customers may not be ready to make the shift. That would require that merchants maintain both traditional and contactless payment terminals. Additionally, contactless payments require a degree of education, both for consumers and your employees. 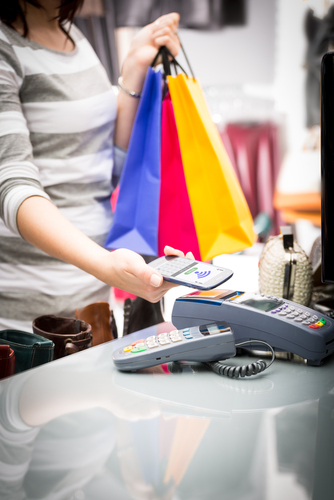 Contactless payments also carry slightly different PCI compliance rules than traditional “swipe” methods. Despite the investment, implementing contactless payments on at least one terminal may prove beneficial: Research reported by the Smart Card Alliance revealed that financial institutions like Chase and American Express (early adopters of contactless payment technology like Blink) reported between a 40 percent and 50 percent time reduction at checkout when contactless methods were used. Additionally, they reported that consumers spent more per transaction when they used contactless payment, compared to cash. An even easier way for customers to pay—phones alone! Though mobile wallets have been available since 2011, supported by companies like Google Wallet, Isis (now Softcard), and PayPal, adoption rates of the technology have been fairly dismal in the United States. Common consumer concerns behind the technology include the lack of enhanced convenience over traditional cards, and confusion around security associated with the payment method. Following Apple’s early September announcement about its new mobile wallet Apple Pay, however, there appears to be renewed optimism. This may be helped by its security features (it uses tokenization so no identifiable customer information is stored or transmitted), the network of more than 200,000 partners, and the ease of use. Unlike past mobile wallet technologies, Apple Pay transactions are conducted using “touch” technology. Despite the media coverage, Apple Pay hasn’t been released to the public. As an executive at American Express recently cautioned, adoption is still expected to be slow, despite Apple’s reputation for innovation and its large follower base. With that in mind, small businesses can take small steps to prepare to be a part of a potential payment revolution. Start by inquiring whether your point-of-sale provider offers contactless payment options compatible with NFC technology, which Apple Pay requires. Stay abreast of news surrounding Apple Pay adoption as it relates to larger merchants, to ensure you’re keeping pace with the technology that consumers are integrating into their payment expectations. October 2015 will see these cards become standard. Is your business ready? Credit card networks have mandated an October 2015 transition to EMV credit cards (which use a chip-based card reader on the front, instead of the magnetic strip on the the back), but many small businesses aren’t equipped to meet the deadline. In fact, experts at Javelin Strategy & Research estimate that only 53 percent of point-of-sale terminals will be equipped by December 2015. Though EMV credit cards have been cited as a superior payment method for delivering enhanced customer payment data security, some of the hesitancy for the new method is likely the cost merchants and financial institutions must absorb to accommodate the change. 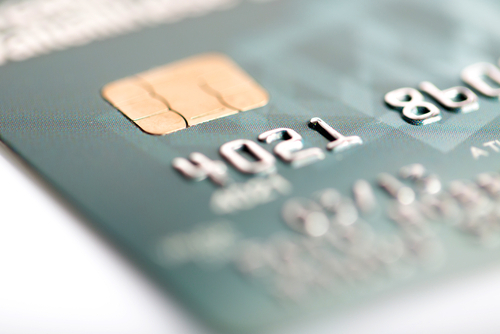 Javelin estimates that each new EMV terminal will cost a merchant about $1,000. Despite the price tag, the mandate for the new EMV system is in place, and the costs of not complying outweigh the required investment, particularly if there is a security breach. As Javelin experts note, smaller and mid-size merchants are inherently less equipped to absorb the high costs of a breach, compared to their larger business counterparts. Will you be implementing any of these new payment options in your business? Share your opinion in the comments below!